"So who created God? In times of inquisition like that of 800 years ago in Europe, this question alone could easily have gotten me killed or at least sent to the torture chambers by the powers that be of the time – the Catholic Church. Yet for me today, it is both a legitimate and a profound question." ~~ From an essay by Fred Burks titled "Who Created God"
Who created God? I realize this is an intense and profound question that can bring up all sorts of sensitive feelings and beliefs. Yet it is a question I have enjoyed exploring from the time I was a young child. I wrote the below essay a few years ago and am posting it now to share with any interested some of my deepest thoughts and questions about life and existence. If any of this turns you off, please just ignore it. May we all find ever more ways to love and inspire each other. And Where Does Consciousness Come From? Every other month I embark on a personal retreat of one or two days of silence and fasting. It's a rich and inspiring time for me to evaluate what I'm doing in my life and explore ever deeper into how best I can serve all beings and support both personal and global transformation. During a two-day silent retreat in late 2010, I had some incredibly deep and fertile explorations which led to this essay and its title, "Who created God? And where does consciousness come from?" So who created God? In times of inquisition like that of 800 years ago in Europe, this question alone could easily have gotten me killed or at least sent to the torture chambers by the powers that be of the time – the Catholic Church. Yet for me today, it is both a legitimate and a profound question. The term God has been used in many different ways and means different things to different people. Largely because of this ambiguity, I prefer either the words Spirit, the Divine, or – what I feel is the best descriptor of what these words are trying to convey – "All That Is." So to reframe the question in my own words: Who created All That Is? Now if a person's answer to this is God, then I again ask: Who created God? Even if one doesn't believe in God or any kind of divine being, the question remains: why does anything exist? Why not just nothingness? And where does consciousness come from? To me, these are the ultimate existential questions. I sometimes get scared just thinking about this stuff. Yet I have found that fear is invitation to growth, if I choose to let it be. Only by facing my own fears have I been able to dive so deep into all that I explore. By looking into even the possibility of ultimate nothingness and meaninglessness, I am choosing to face some of my own deepest fears. And as I explore these potent questions, I ask for and fully trust that I receive guidance. I apologize if my writing in any way offends your religious or spiritual beliefs. I have no desire to convince anyone of anything here. I am only sharing my own personal musings on the subject. If what I write doesn't work for you or offends you in any way, please just stop reading and know that I support whatever path you have chosen for yourself. And if my thoughts stimulate curiosity and new ponderings in you, how cool is that? My current answer to these deep questions – who created God (or All That Is) and where does consciousness come from – is simply I don't know. In fact I have not the faintest idea or speculation on these most core questions of existence. To me this is the ultimate mystery, the deepest part of the divine mystery. I suspect I will never be able to find an answer in this lifetime, and it may ultimately be a question that is unanswerable by anyone in this physical reality. So now that I have created the ultimate blasphemy by questioning even God's origin, where do I continue this line of inquiry? The next natural step for me is to acknowledge that my consciousness exists, and so does yours (or you wouldn't be reading this) and that of every conscious being in the universe. Somehow – though I don't know how – you, me, and all conscious beings who share this universe came to exist. Yet how did the universe come to be populated by all these conscious beings? I've heard some speculate that we all started as one unitary consciousness which eventually split itself into a vast myriad of consciousnesses to explore itself. This is certainly a reasonable speculation, though it does not answer the who created God question. Where did that one unitary consciousness come from? And what existed before that? How could one unitary consciousness even divide itself? By the way, if any of you have reasonable answers to these questions, I would love to hear and consider them. I have no answer and just take it as a given that I exist and we all exist here, otherwise how could I be typing this message and you be reading it? Even if it is, as some say, all an illusion, well then the illusion is all I have to work with. I do suspect that even though I have no idea where it came from, there is and always has been some form of greater consciousness, some integrated collective consciousness of All That Is – call it God if you like. I suspect that somehow this source consciousness may have fragmented in order to explore itself, possibly because being the only thing that existed unto itself was in some way boring. And some or all of these fragments then further fragmented themselves into other conscious entities. Thus were eventually born all of the consciousnesses in the universe. I am not at all sure of this, but at least this is something I can wrap my mind around. Taking this a step further, if there was a source unitary consciousness which fragmented itself, I suspect that since that original fragmentation, there has always been a more expanded collective awareness of all of the fragments, a kind of divine collective consciousness of all beings. And along these lines, I find the holographic model resonates with me. This model or framework proposes that within each of the fragments the whole is contained. So from this viewpoint, there is a greater collective consciousness or intelligence, and within each of our individuated consciousnesses, we have access to this expanded collective awareness. One of the things that complicates all of this is that I have no doubt that there are dimensions of existence in which time does not exist in any sort of linear sense. So maybe trying to explore all of this using a time-based model of cause and effect is simply the futile effort of a very limited consciousness (me) trying to comprehend things in other realms that are simply incomprehensible from the limited viewpoint of a human being. Again, I don't know, but that doesn't stop me from exploring the possibilities. 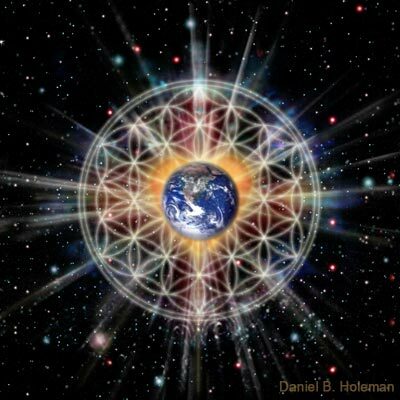 One possibility is that the posited source unitary consciousness might have first split itself into two (yin and yang), then into four, eight, 16, 32, etc., creating some kind of sacred geometry based in what we understand as mathematics. Or it might have been much more random (like chaos theory). Or maybe it was some kind of spiritual "big bang," where the One suddenly exploded into a myriad of fragmented beings. I suspect if there ever was only one unitary consciousness, it likely fragmented through some combination of all of these processes – divine geometry, random divisions, and occasional explosive fragmentation. Diving into the first possibility – that the original source consciousness started with a split from one unitary consciousness into two individuated ones – this could have manifested a primal opposition; a source polarization whose ramifications can still be seen in our world today. The light/shadow, masculine/feminine, yin/yang split which can be seen in many aspects of existence are clear examples. Among humans, some people focus a lot of attention on the polarities they see in life (good vs evil, right vs wrong, etc. ), which could have originated in this original split. Yet clearly this world is not based in dualities alone. There are countless examples of rainbow spectrums where the ends are only the most extreme poles of an entire rich spectrum. Between black and white are an infinite variety of colors. And each of us has at least some qualities of both masculine and feminine within us. It's interesting to note that in the many and vast spectrums of existence, the extremes seem to almost always be shadow images of each other. Black and white are more like each other than all of the other intermediate colors. They are inverse shadows of each other, one representing complete fullness, the other complete emptiness. The choice to focus on polarized extremes shows up in our reality as black and white thinking, which plays an important role in our world. It may even play a key role in expanded realities going back to the posited original split, though I acknowledge all of this is highly speculative. Whether this is true or not, the fact is that many in this world tend to see things in polarized terms of black and white, good and bad. It makes it easier for them to maneuver through an already very complex and sometimes overwhelming life. Generally these people tend to be afraid of their own shadow. They do their best to welcome the light and to destroy, banish, or suppress that which is considered bad or not light, i.e. what many call the shadow, both within and outside of themselves. Yet I think most reading this would agree that this is an overly simplistic view. On the deepest or most expanded levels, I suspect all beings are somehow interconnected, no matter how polarized they may be. We all come from the same original source. And to try to banish or destroy something to which you are always connected is on some level an attempt to banish or destroy a part of oneself. This quote, by the way, is included in a great lesson titled "Beyond Duality" from our powerful Transformation Course. I highly recommend this free online course (see rave reviews here). So what I'm finding is that the desire to see things in terms of duality and the accompanying desire to destroy or suppress the shadow are at the root of a lot of unconscious behavior we see manifesting in our world. This may even be at the root of all suffering. If we consider that there was not just one original split in consciousness, other possibilities unfold. We shift from a polarized worldview to a focus more on the interconnectedness of all beings. If we recognize and honor the full rainbow spectrum of existence and do our best to see the core divine essence in all, it seems only natural to me that suffering would dramatically decrease and love and joy would increase. What say you? No matter how consciousness came to be, the fact is that there are gazillions of consciousnesses which now exist in the universe – from amoebas to human beings to beings in other galaxies and dimensions. And these consciousnesses come together in a huge variety of ways to form groups which interact with each other and with the world around them. Humanity and the vast numbers of groups humans form on this world are but one small example. Ants and mosquitoes are another. I sense that each of these groups, whether human, animal, or otherwise, have their own collective consciousness. Yet they also have their own level of collective unconsciousness or shadow. The shadow aspect is the collective of all parts which the group on some level denies or suppresses. This collective shadow likely has some sort of mind of its own and causes all sorts of problems, or – looked at in another way – creates all sorts of opportunities for growth. I have found that when I consciously choose to shine light on the unconscious or shadow material, my life and the world around me is enlightened. When we both individually and collectively choose to open to our shadows and even learn to dance with them, life can become much more rich and meaningful. And by embracing the light, the shadow, and all aspects of existence, we more easily recognize love as the transformative force which interconnects us all. I have no doubt that sacred love is the ultimate force of harmonious integration. So the divine source consciousness may have have exploded all at once, or it may have split itself into myriad fragments in a more gradual process, and that process is likely ongoing in some way that I am not clear. This grand process of separation is not a bad thing. There is a time for both separation and integration. A wife subject to continual physical abuse from her husband would likely do best to separate from him. I suspect that even now divine consciousness continues to divide and separate itself in order to explore ever more deeply into the divine mystery of life and existence. Yet at the same time, consciousness appears to be in a process of integration. Many of us are in various stages of re-membering the deeper interconnectedness of us all. Some believe that this integration will eventually lead us back into union as one united being. I hear many people these days saying "we are all one." Yet if we were all eventually to give up our individuality and integrate (or disintegrate) back into one unitary being, what would be the purpose of it all? Just to start the whole process all over again? That seems rather pointless to me. Clearly there is some sort of reintegration process happening, and I very much support and am a part of this. Yet I would hope that even as we integrate, each fragment continues to maintain the unique perspective and wisdom it has gained, which can be shared with the collective of all beings. So rather than saying we are all one, I prefer to say that we are all interconnected in a beautiful, divine dance with the cosmos. Each of us is a unique and invaluable part of a greater divine whole. And even as we reintegrate the shadow, the light, and the multitudinous aspects of consciousness into a more aware collective consciousness, we can also retain the beautiful individuality that each of us embodies. Though I highly suspect there is some kind of unitary collective consciousness that both connects and lies within all of us, I know also that my individuated consciousness which is typing these words here is not that unitary consciousness. I and all beings may have access to that collective intelligence, but I am not the One. And I suspect you aren't either. So I don't want you to bow down to me, and I won't bow down to you either. Yet I will most certainly love and honor you as the divine manifestation that you are. My heart's desire is to learn to better dance with you and with all beings. I may never know who created God and where consciousness comes from, but I am thrilled to know that that you are there and I am here. I am excited that we get to explore each other, to inspire each other, to share the unique piece of divine manifestation that each of us are here on planet Earth! That is exactly what I am doing here right now as this divine manifestation called Fred sharing my own particular thoughts on life and existence with you. Thanks for exploring these most intriguing topics with me. I hope that in some small way my musings here may have enhanced the experience of your consciousness living in the ever-present here and now on this beautiful blue-green jewel of a planet. Thanks for being the beautiful expression of this divine mystery that you are. Note: If you're interested in other essays I've written exploring some of the deepest questions in this divine mystery of life, see the website of my personal musings at www.divinemystery.net. For the fascinating story of my explorations down the rabbit hole and back to magnificence, click here.